Pardon the in your face picture, but I think I was trying to eat this sandwich through the camera!! I have been having a love affair with anything “caprese” lately. I adore caprese salad and even turned it into a sandwich with my Open Face Chicken Caprese Sandwich! So the other night Subway was mentioned on my Facebook page as an alternative meal due to the fact that I had a major blond moment and forgot to thaw out the meat I needed for dinner that night. Well Kevin isn’t a big fan of Subway so that didn’t go over to well (plus I really needed to cook so you all would have a post to read). Luckily Kevin agreed to go to the store for me on his way home from work and the meal crisis was avoided. Yay!! But that did give me an idea. One of the sandwiches I loved at Subway was their meatball sub. I wanted to make a meatball sub, but add a twist to interest Kevin. If you have been with me for a while you know that he used to despise pesto until he tried my homemade pesto. Now he loves it and I have used it in several recipes. Anyway, I remembered seeing a recipe by Kelsey Nixon for Caprese Meatballs in the slow cooker, so I decided to take that idea and use it for my sandwiches. I didn’t do mine in the slow cooker though. I baked them and finished them in my homemade marinara sauce. It seems that I have been coming up with some messy sandwiches in the last couple of weeks. Yes, this is messy but the flavors are so good! 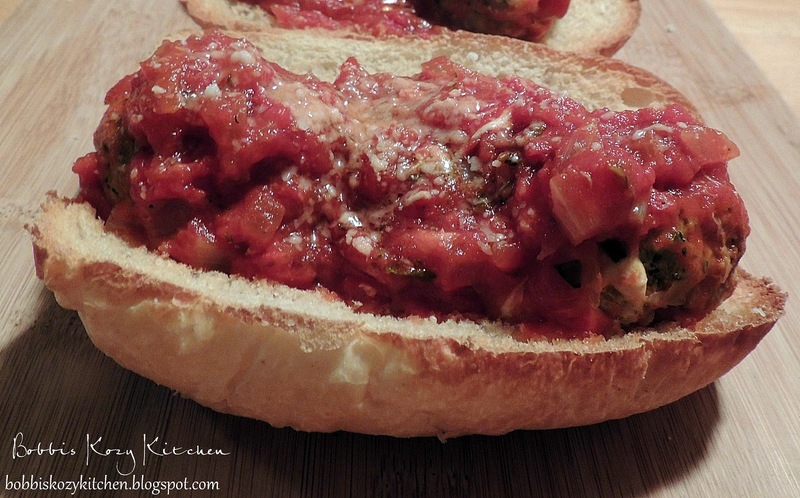 The mix of the pesto, marinara sauce, mozzarella cheese, and crunchy bread was over the top. I fill up pretty quickly, especially if I am eating bread, so I had half of my sandwich left and Kevin gobbled it right down. I think the only conversation I got out of him during the meal was mmmmmm and WOW this is really good. I was really glad he liked is since I pretty much made it for him! The recipe is for 2 subs so if you are making more just double or triple it. But it makes 6 good sized meatballs which was perfect on the rolls I picked up from the bakery and with the cheese and sauce they are very filling. Plus they went really well with a nice glass of red wine!! Toast pine nuts in a skillet over medium heat until fragrant, tossing occasionally to ensure even toasting, about 5 minutes. Combine all of the pesto ingredients, except the olive oil, in a food processor and pulse, drizzle in the olive oil slowly until well combined but still rough-textured (You may not use all of the oil or you made need a bit more to get to the desired consistency). Leftovers can be frozen if needed. Combine the turkey, breadcrumbs, Parmesan, pesto, salt, pepper and egg in a large mixing bowl with your hands, taking care to not overwork the meat. Form golf ball-size meatballs and stuff each with 1 mozzarella cube. Evenly space the meatballs on the baking sheet. Bake until just starting to brown, 15 minutes. Remove the meatballs from the oven and place them in the simmering sauce, cover with the lid. Split the sub rolls and open them slightly, place on a baking sheet and bake in the oven until toasty, about 5 minutes. 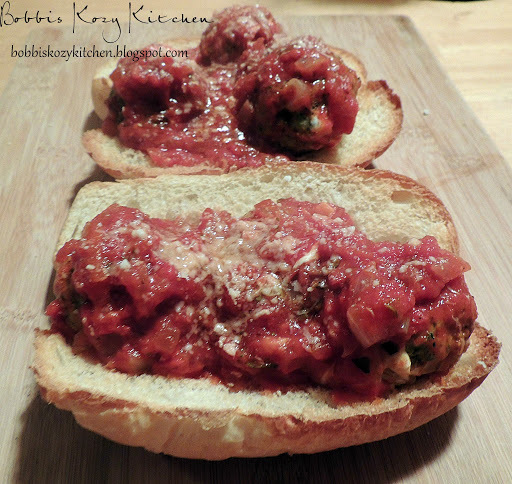 Place 3 meatballs on each sub and smother with with the marinara sauce, top with a sprinkling of Parmesan cheese.